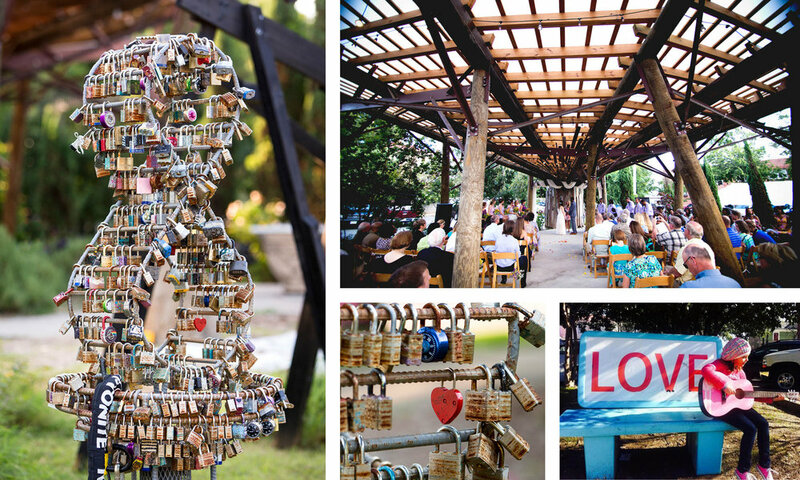 The Love Locks sculpture in The Bernice Garden draws people from all over the country – and all over the world – to show their love for Little Rock or, more likely, to seal their love for that special person with more than a kiss. From hand-painted to custom-engraved, no two locks are the same on this eye-catching attraction. Couples can celebrate their engagements, weddings, or anniversaries. Graduates or award-winners might mark their special days, and visitors from afar just might leave permanent reminders to verify their visits to SoMa. The Love Seat, located on the opposite side of the garden from the Love Locks, has taken on a life of its own. Who’d have thought an unassuming bench would have its own Twitter account? (@LoveseatLR ) Folks from all over celebrate their love for their BFFs, beloveds, pooches, and parents by snapping selfies of themselves and significant others on the big-hearted bench. Rest those tired tootsies enveloped in love vibes – and maybe snap a selfie or two. Weddings in The Bernice Garden are the ultimate expressions of love in SoMa and grace the area with temporary living art displays. Since the pavilion is open for all to see, residents and visitors who happen by at the right time often stop to smile and share a moment of beauty and joy – from a respectful distance, of course. No two weddings have been alike but all have been glorious. Nothing brightens the evening sky like newlyweds’ smiles, and the sun always seems brighter when reflected by a bridal party. Even if it rains, beauty doesn’t run – love and loveliness are impervious to a little downpour. The sidewalks of SoMa’s shopping/business blocks can be quite crowded at times with people of all ages, colors, religions (or no religion), and sexual orientations passing by with friendly hellos or stopping to chat with old pals – or people they just met. Everyone is welcome, and newcomers or visitors aren’t strangers, just friends-in-the-making. Strollers are a common sight, with so many young families choosing to make the happening area their home, and wheelchairs have easy access on every block. Dogs are everywhere, on leashes, of course – SoMans love their canine companions. But not to worry. This is a neighborhood of pooper-scoopers, and some businesses leave water bowls outside for parched pooches. Residences surrounding the main drag are also inclusive, with everything from humongous historic homes to tiny cottages to European-style new construction in assorted sizes to apartments or condos for every budget. Want to live in a converted church? An apartment in a former school, with chalkboard included? Yeah, SoMa’s got those, too.